After what feels like a month of hibernation, Mr. Andrew and I took advantage of the slightly warmer weather to get out and do stuff. On Friday, we went to the Arts and Letters Club for an evening of Dada-inspired art exercises. 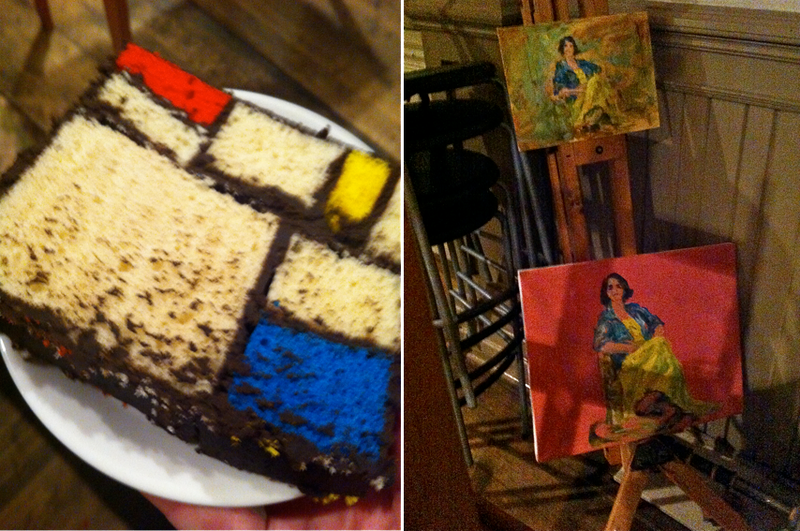 We made collages, created cut up poetry, performed some crazy theatrical scenes and ate Mondrian cake. I love the Arts and Letters club (we had our wedding reception there) because of its history (the Group of Seven painters, Robertson Davies and Marshall McLuhan were all members). Stepping into the building is a bit like entering a time machine or transporter — the main space feels looks like Hogwarts! The event was held upstairs in the studio, where members have life drawing sessions. I snapped a few pictures of artists studies.